Want to get the education and training you need to get an excellent paying job, but don’t have the time or resources to obtain a college degree? Luckily, there are many careers that offer great pay and job security for individuals who have never completed college. While skills gaps are typically thought of to be associated with high-skill tech or healthcare jobs that need advanced degrees, gaps are present in many professional areas that don’t necessarily require such a high level of education. Employers are interested in hiring candidates they know can adequately fill the roles in their company, and many of those candidates will have learned their skills outside of a formal classroom. The following list shows ten of the hottest in-demand jobs that don’t require you to complete two or four year degrees. Maintenance and Repair Workers – Considered to be a jack-of-all-trades, these workers can take care of a wide range of duties such as electrical work, plumbing, and painting. Massage Therapists – Massage therapists use a variety of techniques to help reduce and relieve pain by loosening tense muscles. Web Developers – Great with both computers and design, web developers design and maintain websites as well as ensure the proper content, graphics, and underlying structures are used to meet the specific goals of the website’s owner. Computer Support Specialists – These specialists help and advise computer users and organizations by supporting computer networks or by providing technical assistance directly to those using the computers. MRI Technologists – MRI technologists take images of patient’s organs and other internal parts using machines that contain magnetic fields and radio waves. Tax Preparers – These professionals calculate, file, and sign income tax returns on behalf of individuals and businesses. Dental Hygienists – Dental hygienists clean patient’s teeth and educate them on how to brush and floss properly. Pharmacy Technicians – In this position, techs assist pharmacists with dispensing medication to both customers and healthcare professionals. 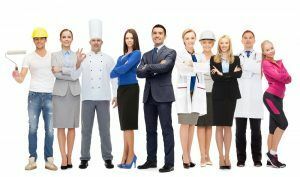 Food Service Managers – They work with both the staff and the guests while taking care of the daily operations involved with running a successful restaurant business. Medical Assistants – Workers complete administrative and clinical duties in the offices of physicians, hospitals, and other healthcare facilities. To get into jobs like these, you may not need a college education, but you do need some sort of training or experience. Signing up for a training program, such as LifeWorks, can help you gain the job-related training and certificates you need. In addition, you will be able to master the soft skills required to be successful in both business and life. Plus, you’ll have access to a team of coaches who will help guide you to the right career path. If you’re looking to do something positive that will help change your life, contact The Jobs Partnership by calling 407-641-0755 or apply now for our no-cost LifeWorks training course.